26 If any one thinks he is religious, and does not bridle his tongue but deceives his heart, this man’s religion is vain. 27 Religion that is pure and undefiled before God and the Father is this: to visit orphans and widows in their affliction, and to keep oneself unstained from the world. What causes wars, and what causes fightings among you? Is it not your passions that are at war in your members? 2 You desire and do not have; so you kill. And you covet and cannot obtain; so you fight and wage war. You do not have, because you do not ask. 3 You ask and do not receive, because you ask wrongly, to spend it on your passions. 4 Unfaithful creatures! Do you not know that friendship with the world is enmity with God? Therefore whoever wishes to be a friend of the world makes himself an enemy of God. 5 Or do you suppose it is in vain that the scripture says, “He yearns jealously over the spirit which he has made to dwell in us”? 6 But he gives more grace; therefore it says, “God opposes the proud, but gives grace to the humble.” 7 Submit yourselves therefore to God. Resist the devil and he will flee from you. 8 Draw near to God and he will draw near to you. Cleanse your hands, you sinners, and purify your hearts, you men of double mind. 9 Be wretched and mourn and weep. Let your laughter be turned to mourning and your joy to dejection. 10 Humble yourselves before the Lord and he will exalt you. There is a common theme to both passages, namely, not letting yourself be held captive by the world. Or, as St. James explains, not to let ourselves be “stained” by the world. This lesson is fairly common in Christian theology, and for good reason. It is absurdly easy for us to lose track of what matters, and to whom we belong. Our love as Christians is reserved for God, and for our fellow men, not for the world. The more ties we have to the world, the more stained our souls become, and the more distractions there are which will cause us to lose sight of what is important. Lest I repeat myself further, I will close this part by simply noting that we should always be asking ourselves if our actions are Godly, or Worldly. The reason for the contrast is simple. Those who are urged to humble themselves by James are those who have embraced the world and lived in sin. Their joy, arising from their sinful lives, is only temporary. Unless they repent and “mourn and weep” as part of begging forgiveness from God, then they will find themselves lamenting not in this world, but in the next, where the lamentations will never end. Our happiness and joy in this life should come from God and His works. If it doesn’t, then we should must mourn instead, and cast that life, and the evil it contains, away from ourselves. The alternative is to never again find our way back to the path of life. I hadn’t realized it until just recently, but Novaseeker over at Veritas Lounge returned to blogging. He had let his blog lapse for a while, but restored it and has written two posts that warrant further analysis and discussion. They both revolve around a common theme, namely, the nature of the struggle that we face now here in the West. What we see here is nothing less than the development of a new orthodoxy, together with the enforcement mechanisms which go along with any system of orthodox belief. Clearly this is the enforcement of a moral orthodoxy — or, rather, an enforced set of rules about permitted academic investigation or engagement which are in turn based on a preconceived moral orthodoxy. It’s quite telling that the ultimate justification, the “punch line” if you will, is that of having “the moral upper hand”. This is the ultimate “moral” (in reality, ideological) basis which justifies the accepted orthodoxy of one’s actions, and which trumps the academic freedom of any dissenters from such “consensus” orthodoxy. Of course, while being both banal and unsurprising, it is nevertheless ironic (and an irony that appears completely lost on most of the academy, alas) that a group which has claimed inherited solidarity with Galileo in the face of his persecution for articulating ideas which went against the orthodoxy of his day has now completely turned around, and essentially become its own perceived caricature of what it has despised — namely fulfilling to a tee the academy’s caricature of the Christian church as an ideologically-based enforcer of an orthodoxy of ideas, based on a set of moral principles held in consensus by its own appointed few. What we are witnessing is nothing less than the “coming out party” of a new church — complete with a priesthood, monasteries and an emergent, and zealously enforced, orthodoxy. The cultural elites of the West, located in the Media, Academia and the overall “Education Establishment”, have begun to take on the role of the First Estate. Like the clergy in Medieval times, they are largely in a position to define the moral order for overall society. The amount of influence they now wield dwarfs anything that their opponents can muster. For some time the media, although it was just the “press” back then, was referred to as the Fourth Estate. This is because they were outside of the overall power structure as it existed back then, but still wielded influence (and through it power). No longer. Now the media is very much integrated in the social order. They are joined in this by a powerful Educational Establishment, which molds the minds of citizens starting in kindergarten (or even sooner) all the way through post-graduate education. It is this conglomeration of influence wielders who determine what is, and isn’t, acceptable in society. For an idea of what that means, see here. Under the present system Transgress those boundaries and at best you find yourself a social pariah, with fines and imprisonment possibilities for greater infractions of the social order. What is new, however, is the brazenness of it all. That approach and tone comes when people generally feel invulnerable to their critics. The ideological left (which is what the academy is – it isn’t a centrist, pragmatic left, it’s generally an out-there, radical, ideological left) is basically doing a socio-political-cultural celebratory dance. Virtually all of their goals have either been achieved or are well within reach. They know this. Hegemony is theirs – at least for the foreseeable future. So, this gives them the courage simply to state explicitly things that previously everyone familiar with the academy tacitly knew, but didn’t expressly say – it’s the most brazen stage of the entire development by which the academy has become monolithic in outlook while at the same time hugely increasing its influence over the state and the society at large. He goes even further in explaining the situation, and I strongly recommend everyone to read the whole post (and its follow-up). This is a religious fight, from start to finish. It’s best that we see it that way, that we may approach it properly and with the most appropriate tools. I have gradually come to the conclusion that the current “struggles” we face concerning the “culture” — whether we are discussing the impact of the sexual revolution, the decline of religion in the public square, the increase of all kinds of license, the coarsening of society, the decline of family life, etc. — are primarily not cultural struggles at all. And neither are they political struggles, although certain aspects of these elements have been aided and abetted by political action and legislation. By contrast, it strikes me that the cultural and political elements we are seeing are merely manifestations of a broader spiritual struggle — a larger element which underlies these other manifestations, and unites them into a larger, cohesive, and more dangerous, whole. I owe Novaseeker a debt of gratitude for this part. While I had always sort of known this, in the sense that I had all of the pieces in my mind, I hadn’t put them together. When assembled, they clued me in to the fact that the First Estate, as I had envisioned it, was not merely composed of cultural elites, but spiritual ones. In fact, the media’s influence is as much spiritual as it is cultural, as they help mold and define what is good, and what isn’t. The same applies to Academia. My suspicion is that the lack of clarity over this is deliberate- a product of the machinations of the new First Estate who want to keep everyone else in the dark about what is really going on. They have created distinctions between culture and spirituality that exist only in our minds- they are no more real than the false deity that has been constructed by this new First Estate over the last few decades to centuries. What is going on now is nothing more, and nothing less, than a war for the Soul of Western Civilization. A campaign is underway to remove the last (overt) traces of Christianity from what used to be known as Christendom, or what we more commonly refer to now as Western Civilization. In fact, campaign might be too generous. Because by all appearances the adversary has already all but won this war, and is in the process of securing its victory. The question before us is this: What now? What shall we do? How shall we respond? Will we keep fighting, even though we cannot win (by ourselves, at least)? While it is doubtful that we will be fed to lions or suffer the other forms of torture and execution that the first martyrs faced, suffering is clearly ahead. Loss of property is assured. As is loss of freedom. Perhaps scarier, loss of family- no doubt those with children will see them taken away and sent to who knows where. Or do we instead “flee to the catacombs”? Do we hide away in small communities and isolate ourselves from general society? Perhaps we can literally flee to the mountains or otherwise sparsely inhabited regions in order to escape the coming persecution. Because that is coming, as surely as night follows day. The new First Estate cannot tolerate the presence of another source of moral authority, or at least, one which is opposed to it. Or will we surrender? Do we given in, and compromise our faith that we might live in peace? Most likely Christians will still be allowed to practice their “faith” if they simply drop those parts which offend the morality and sensibility of the new moral order. We will be allowed to worship our God all we want, so long as we also worship theirs as well. It won’t be that difficult either, I imagine, besides giving lip service to their “good”, and saying the right things and hating the right things. Perhaps these are the end times, and the Day of Judgment will soon be upon us. Or maybe this is just another period of brief darkness that will pass in time. Either way, we cannot tell beforehand. The only thing that we know for certain is the choice we have to make. Fight, flee or surrender? 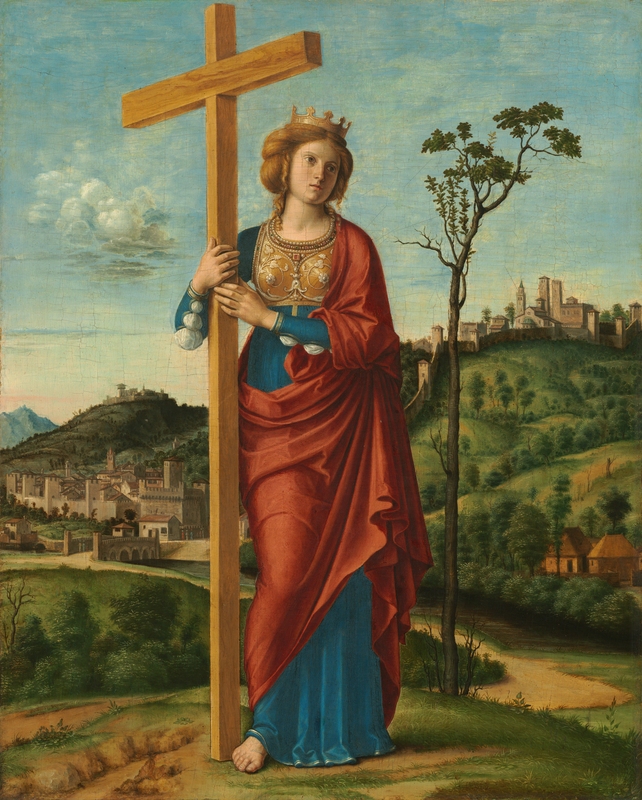 Saint Helena or Saint Helen (Latin: Flavia Iulia Helena Augusta; c. 250 – c. 330) was the consort of the Roman emperor Constantius Chlorus and the mother of the emperor Constantine the Great, an important figure in the history of Christianity. She is traditionally credited with a pilgrimage to Syria Palaestina, during which she discovered the True Cross of Jesus’s crucifixion. She is revered as a saint by the Eastern and Oriental Orthodox, the Roman Catholic, the Lutheran, and the Anglican churches. I found her interesting for several reasons. To begin with, she was the mother of Constantine, who had a significant impact on Christianity’s early development. Also fascinating was that she was heavily involved in searching for early relics of Christian history and tradition. During her trip to the Holy Land she also helped found several churches, including the Church of the Nativity. So all in all, she exerted a great deal of influence in her lifetime (which was pretty long for that time). I’ve been talking offline a bit with a woman who can be somewhat critical of the manosphere. She’s definitely on our side in her opposition to feminism and support for natural gender roles, but she finds our vitriol to be somewhat counterproductive. She’s very big on Christian love, charity, and forgiveness, believing that we can never really know why somebody ended up being a certain way. She believes that were we more understanding and less quick to criticize, we’d be more effective. 2) It is impossible for us to truly understand why someone chose to act or be a certain way. 3) If the manosphere was more empathetic, and less critical, it would be more effective in getting its point across. 4) It is important for us to understand people and why they do what they do. Point 1 is something that I agree with. Of course, the manosphere is more about “educating” men than it is about “fighting for the cause.” As for point two, I agree with it in the sense that people are complicated creatures and it is impossible to know everything that makes them “tick.” However, I also disagree with it, in that as a Christian I understand that human beings are fallen creatures who are predisposed towards evil. So in a way we do know why they ended up a certain way… when that way involves sin. Regarding point 3, I think that the woman misunderstands the nature of the manosphere. As I pointed out in response to point 1, its primary purpose is to educate men. But ultimately, these aren’t the points that matter. It is point 4 that drives this post, because I have seen arguments similar to it before. Something that I hear not infrequently is that we as Christians shouldn’t be hasty to judge/evaluate others, because we don’t know what kind of life they have lived. We don’t know their hardships, their trials, the difficulties that they have endured. And principally this line of thought is applied to people who have engaged in sin, or are living lives of outright sin. An example of this would be “We don’t know why she decided to become promiscuous/a prostitute. She could have been neglected or abused growing up!” Or “Don’t be so harsh on him, he had a tough life. Its no wonder he became a criminal.” Of course, there are many, many other such examples. What I am curious about is just how Christian this whole line of thought actually is. Many of my readers have a far better knowledge of Scripture than I, and the Catholic/Orthodox readers probably are better with Tradition as well. So I am asking for your assistance in this matter. Where in Scripture does it say that we should be understanding of what causes people to sin? I haven’t found anything yet which seems to support that notion, but of course I could be missing something. The reason I’m asking about this is because I think that this desire to “understand” people is often used as a means of excusing sin. Even if it isn’t used as an excuse, I think it is at best a distraction, as it is something that ultimately doesn’t matter to us as Christians. And frankly, I think it is used far more as an excuse than for some alternate purpose, like relating to someone better or helping them turn their life around. Although in most cases I don’t think it is outright intended to excuse sin. Rather, it is those preach “Christian love, charity, and forgiveness” who seem to be the most likely to do it, because they want to be loving and understanding. But I think that while their intentions might be noble, they have lost sight of what they are actually doing. But then again, I could be completely wrong here. So if anyone has anything to contribute, please do so. Like any part of the internet, this particular section is not immune to “flame wars” or other heated disagreements. In fact, we have seen more than a few since I first started blogging, and more before that when I was only a commenter or lurker. Now, I don’t find them to be terribly helpful, and in fact believe that most of the time they cause unnecessary division and infighting. Given the present social/cultural environment, I don’t believe it helpful for blue-on-blue fights to break out. The thing is, I believe that such conflicts are often avoidable, because more often than not they seem to be the product of miscommunication or misunderstandings. It is far from uncommon for the conflict to die out once one side or the other, or sometimes both, realize what was really trying to be said. Were there better avenues of communication to begin with, then perhaps in-fighting wouldn’t have broken out, and instead matters could have been discussed/debated and resolved in an agreeable, and certainly less public, fashion. Towards that end: if anyone has a problem with something that I have written- whether they think it merely incorrect, or accidentally (or purposefully) serving feminism/the feminist imperative, or is in otherwise need of correction- then I would ask that person to contact me via e-mail first. You can find it in the About section. Hopefully we can work out any disagreements through e-mail first, before letting it spill over into posts and comment sections. Ultimately, I think that will help keep in-fighting down, and allow us to focus more on the topics/subjects that are important to us, rather than get bogged down by internecine warfare. There a several important points to be grasped in this passage, but the one I want to focus on is in the middle, when God passes by Elijah. In telling us that God wasn’t in the overpowering events that swept by the cave, but in the quietest of sounds, Scripture is teaching us that God works in quiet deeds as much as mighty ones. We are reminded that signs of His presence can appear in all things, great and small. We shouldn’t focus on the “big things” in life, but instead look for, and accept, that He is everywhere, when when we least expect it. In fact, it is a common theme throughout Scripture that God’s presence was not recognize by his people. Of course, Christians understand exactly whom this passage referred to: Jesus of Nazareth, or God among us. God walked amongst his people, as foretold in prophecy, and yet His people did not see, or understand this. They saw only a man, nothing more. This is because they had closed their hearts, and their minds, to what God intended. Rather, they had their own ideas on what to look for, on what to expect from the one who was to come. They expected the mighty presence of an earthquake or fire, not the quiet voice. They looked for a lion, not a lamb. If we are not careful, if we let our pride and our own desires interfere with our senses, then we too will fail to observe God’s presence in our lives. We must learn to open our eyes, and see what is true, and not what we expect. Saint George (Greek: Γεώργιος (Georgios), Classical Syriac: ܓܝܘܪܓܝܣ (Giwargis), Latin: Georgius; c. 275/281 – 23 April 303 AD), born in Lydda, Roman Palestine, was a soldier in the Roman army and was later venerated as a Christian martyr. His father was Gerontius, a Greek Christian from Cappadocia, and an official in the Roman army. His mother, Polychronia was a local Greek Christian of Palestine. Saint George became an officer in the Roman army in the Guard of Diocletian. In hagiography, Saint George is one of the most venerated saints in the Catholic (Western and Eastern Rites), Anglican, Eastern Orthodox, and the Oriental Orthodox churches. He is immortalized in the tale of Saint George and the Dragon and is one of the Fourteen Holy Helpers. His memorial is celebrated on 23 April, and he is regarded as one of the most prominent military saints. In the year AD 302, Diocletian (influenced by Galerius) issued an edict that every Christian soldier in the army should be arrested and every other soldier should offer a sacrifice to the Roman gods of the time. However, George objected, and with the courage of his faith approached the Emperor and ruler. Diocletian was upset, not wanting to lose his best tribune and the son of his best official, Gerontius. But George loudly renounced the Emperor’s edict, and in front of his fellow soldiers and tribunes he claimed himself to be a Christian and declared his worship of Jesus Christ. Diocletian attempted to convert George, even offering gifts of land, money and slaves if he made a sacrifice to the Roman gods; he made many offers, but George never accepted. Here was a man who was offered not simply a choice between life and death, but between a life of luxury and power and a death both painful and humiliating. There is a stark comparison to be made between the test that St. George faced in the court of the Emperor, and that faced by Jesus during his forty days in the desert. So in a way it is altogether fitting that he graces this blog during the season of Lent.